Teddy and I had the pleasure of dining at Catalyst, a modern American restaurant in Kendall Square. The verdict – wonderful!! The atmosphere at the restaurant is amazing – really relaxed with comfortable chairs that made me feel like we were eating in a living room. Another (random) thing that I really liked – the tables were really far apart from one another. This made for a very intimate dining experience, as we didn’t feel like we were yelling to hear one another speak. Another highlight of the evening was the beer list. We had thought about going to another bar later in the evening for drinks, but the list was so impressive there that we were more than happy to relax at our table! I had a bourbon barrel aged beer that I previously tried at Mead Hall – it was just as good as I remembered! Now onto the food. Wow! Everything was exceptional. We started with buffalo “chicken” cauliflower. This was so exciting! As a couple that is half vegetarian, any time we both can enjoy a “fake” meat, we’re happy. I then enjoyed really amazing mushroom pasta which had a wide array of mushrooms. Finally, for dessert we had a wonderful chocolate treat. The best part for me was the rosemary caramel sauce – such an interesting and lovely treat! Overall this was one of my favorite restaurants we’ve eaten at in the Boston area – maybe a tie with Oleana. I loved the atmosphere, the food and the drinks list. Everything you need for a great evening! This weekend was particularly special as it was my birthday! That’s right, I’m officially one year older. We got the party started early at work when one of my co-workers brought in yummy cupcakes from Sweet. I had a snickerdoodle one and it was awesome – what a great idea for a cupcake flavor! That evening Teddy and I had a fantastic meal at Ten Tables. We enjoyed a lovely walk in the snow-covered neighborhood and had an early night. It was just perfect! On Saturday my parents had planned to come into town, but unfortunately they were both sick. They’ve been having a difficult time this winter, so hopefully we’ll catch up later this week. That didn’t detour us from still enjoying our day, though. Our first stop was the Harvard Museum of Natural History. We both particularly enjoyed the Scott Miller exhibit. The photographer spent time in the back country of Maine, shadowing the region that Henry David Thoreau explored more than 200 years ago. Both Teddy and I loved the beautiful images of Maine – we’ve spent quite a bit of time there, and it made us both want to go outside and explore more. Hopefully we’ll be able to find some time to go camping soon. We need to prioritize it more, seeing as it’s something we both really enjoy. We spent the rest of our time in the Peabody Museum, one of the oldest archaeological and ethnographic museums in the world. The exhibits are divided into North America, South America and the Pacific Islands. We particularly enjoyed the art from the South American regions. The entire museum really reminded me of the Redpath Museum at McGill – same vibe, similar types of display cases, same type of stuff on display. I got nostalgic, but it was great! After a quick stop at the Cambridge Public Library, we headed over to Trillium, a great brewery in the south of Boston. They have an awesome selection of IPAs so we got some great drinks to share with friends later. After jumping back on the T we jetted over to Newberry Street and headed to Warby Parker. Teddy picked out some great new glasses and then we wandered around the neighborhood and wandered into a great used book store. Our final stop of the evening was a friend’s house for…what else, but another game of Catan! It was great evening. Sunday was a bit quieter, but I got quite a few errands done and prepared for a rather stressful week. I watched a bit of the Super Bowl and quite a few episodes of Gilmore Girls. It’s looking like we are going to get another snow storm – time to hunker down again! On Friday evening Teddy and I had the pleasure of dining at Ten Tables in Cambridge. I live quite close by so we’ve been taking about going for a while. I’m glad we finally did – we will certainly be back! The restaurant is farm to table style – very local ingredients and a small, frequently-changing menu. They pride themselves being a neighborhood restaurant, and we certainly found this to be true. We were quickly seated and both felt that the atmosphere was very cozy and warm. We decided to forgo appetizers as neither of us was starving, so we started with some wonderful crusty bread and some white wine. We chose the house white, and both felt that it was a great accompaniment to our meal. I enjoyed a lovely salmon dish cooked with a red pepper sauce, cabbage, and ricotta ravioli. The entire dish was exceptionally wonderful. The salmon was flakey and moist and the sauce paired wonderfully. Teddy had a stake which he was incredibly excited about, and it was cooked to perfection. For dessert, I enjoyed cinnamon churros with a basil creme fresh. Teddy had a candied bacon pound cake treat that he has been eye on their menu for months. Both far surpassed our expectations! The churros were still warm and light on the inside while the outside was covered with yummy cinnamon sugar. Teddy’s cake was dense but not too sweet. 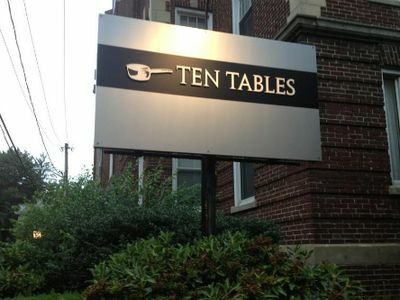 Overall, we had a fantastic time at Ten Tables, and are looking forward to the opportunity to return. The service was exceptionally attentive, the food was very memorable and unique, and the atmosphere was perfect for a romantic evening meal. Add this place to your must-eat-at list! So, have you seen the weather up in Boston lately? Yeah…we have snow. Kind of a lot. Whoo blizzards! We got between 2-3 feed over about 36 hours. Maybe it’s the winter baby in me, but I always love a good storm. Everything gets all quiet and sparkly and cozy. Another perk of the storm – I had to work from home for two days. Sometimes it’s just really nice to work with my slippers on and a big cup of tea next to me. Plus, the week is almost over, and I have fun plans for the weekend. Here’s hoping the rest of the week zooms by! On Friday Teddy and I had some friends over for a relaxing evening. I made another crockpot meal on Thursday night (this time a lovely chili recipe from my mother) and it was so great to come home to the smell in my kitchen! It also took a lot of the pressure off having friends over on a Friday – I could relax instead of getting right into the kitchen when I got home. I also made some fresh biscuits to go with the chili. We enjoyed a lovely evening of dinner, wine, and quite a few games of Settlers of Catan. We are officially addicted! It was really nice to stay in on a Friday, though – more relaxing, and much less expensive. On Saturday morning we awoke to a winter wonderland – it snowed quite a bit overnight. It looked so pretty! We had a very lazy morning and stayed in bed reading for quite a while. I’m addicted to my current book, and it was nice to spend a while relaxing in bed. Teddy spoiled me by making a lovely breakfast for us, and then we spent a while catching up on Top Chef. This season is set in Boston, so it’s been really fun to scope the restaurant scene in our area through the show. I made some great progress on my next knitting adventure, so again, it was great to spend time together relaxing. In the afternoon we were both feeling a bit cooped up and wanted to see Cambridge covered in snow. We took a nice long walk around the neighborhood before doing a few errands. We came home and finished the leftovers of chili and biscuits for a quick and easy dinner. On Saturday evening we headed to a friends house for another board game night. We’ve been doing that a lot lately, but it’s such a great winter activity! Cheap, easy, and a great way to spend some time. The walk over to this friend’s house is about 30 minutes, and Cambridge was looking like a beautiful winter wonderland! It was lightly snowing still, everything was all twinkling and just looked so cozy. Cambridge sure looks beautiful in snow. Then again, I really like the winter, particularly when I don’t have to be driving. It wasn’t too cold, and it was just so beautiful. Anyway, at the friend’s house we played Endeavor, a game involving maps, colonialism, and a little bit of slavery. Once you get going it really picks up, but it was a bit complicated to learn. I ended up not losing (YAY!) and would totally play it again. Another one to add to the list of potential gifts for Teddy! On Sunday morning I did my usual errands, but I didn’t make it out for a run. That’s the only bad thing about the snow – the sidewalks were looking pretty treacherous! Instead I took a nice walk and worked on some knitting in bed. I’ll take it! Teddy and I spent the afternoon planning for an upcoming trip, and later I chatted with my parents. I ended the evening having dinner with some friends, and doing some meal prep for the next few days. It looks like we’re in for a huge snow storm, so I’m getting ready to hunker down! Do anything exciting this weekend? On Saturday evening Teddy and I had the pleasure of attending a performance by the Boston Symphony Orchestra! The tickets were originally a Christmas gift to Teddy’s parents, but unfortunately they got sick at the last minute. Instead, my roommate was able to attend! As a professional pianist, she appreciates the symphony so we were thrilled to go with another music lover. 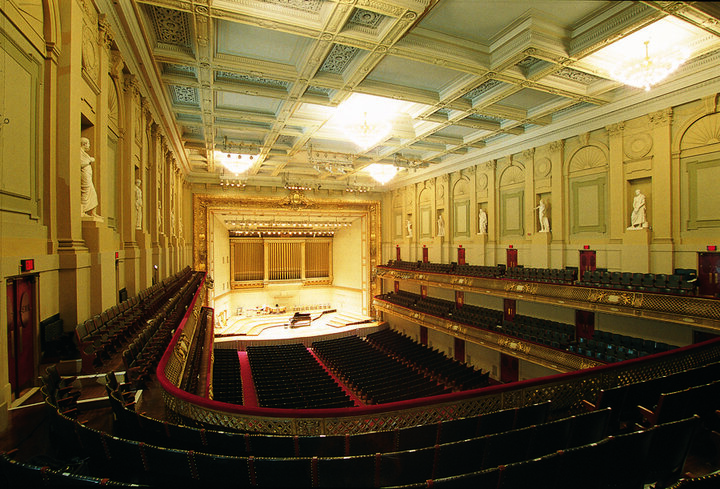 It wasn’t too long ago that I was at Symphony Hall to hear the Handle and Haydn Society perform and, as always, the hall was looking beautiful. I love the acoustics, and an excuse to get all dressed up and have a classy evening – perfect! The program for the evening included Brahms’ Variations on a Theme by Haydn, Haydn’s Symphony No. 90 and Strauss’ Don Quixote. I have to admit that I enjoyed the first two pieces much more than the last – Strauss can get a bit funky sometimes. I didn’t help that I’m not familiar enough with the story of Don Quixote to appreciate the nuanced ways that the piece blends with the story. I do always love an tasteful wind machine appearance though, so I enjoyed the Strauss for that! My favorite piece of the evening was certainly the Brahms. I particularly love the variation that begins the piece – so beautiful! However, perhaps the most memorable part of the evening was during the last movement of the Haydn piece. There was a deceptive cadence so effective that a small portion of the audience began clapping! It was awkward to say the least. I’ve never seen that happen before. To make it even more entertaining, the program notes specifically mention that cadence and how convincing it is. Clearly there was a large part of the audience that was fooled! Ultimately we had a lovely evening, and I’d highly recommend an evening at the symphony in Boston if you ever have the chance!